Functional Shift | Thoughts on the English language, where it came from, how it works, and why it matters. Can Dogs Predict Phonemic Splits? Scarlett chills with one of her many frisbees. In my previous post, I wrote about research in which dogs have demonstrated remarkable levels of lexical comprehension, which raises interesting questions about the extent to which language-acquisition abilities long considered uniquely human (or at least uniquely primate) may not actually be exclusive to humans or even to primates after all. 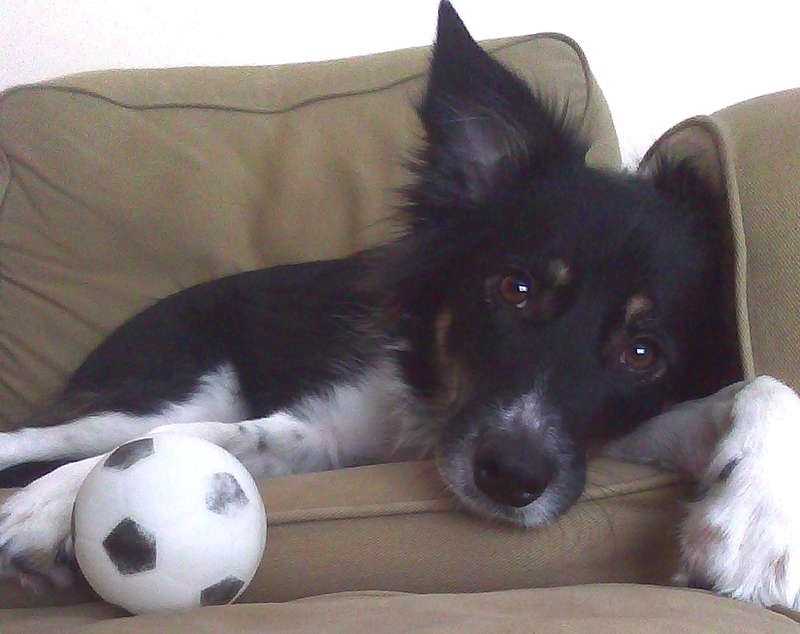 Pilley and Reid (2011) report that in a series of experiments, a border collie named Chaser consistently demonstrated her understanding of the connection between words and their referents and even interpreted human grammatical structures to make meaning. based on Pilley and Reid (2011). Pilley and Reid report that in monthly tests of her vocabulary over a period of three years, Chaser consistently scored 95% or higher on tasks to show that she recognized and could accurately distinguish among the 1,022 distinct combinations of sounds (i.e. words) that she had learned as names of objects and that she had “no difficulty in discriminating between the many different sounds of the nouns given to her as names for objects” (194, my emphasis). Much of the discourse surrounding the research with Chaser and other studies in dog linguistics has focused on the lexical: the extent to which the dogs understand words. But in spoken language, words are just combinations of sounds, specifically speech sounds — realizations of phonemes — that in combination become distinct and meaningful. But as we’ve seen, the phoneme is not a discrete, static thing but is fluid, variable, and relational, as are the ways in which speakers (and apparently non-speakers, including dogs) come to understand them. how we (again, people and dogs) conceptualize categories, relations among their constituents as well as across boundaries, and the boundaries themselves. So, can dogs predict phonemic splits? Considering the mercurial nature of the phoneme (and of attempts to define it), alongside the ways in which we (people and, it turns out, dogs) use categories to make sense of things and language to help define them, got me wondering about whether dogs might be sensitive in ways that humans may not be with respect to phonological variation among speakers, and if so, what that might mean about their possible perceptions of sound changes in progress. 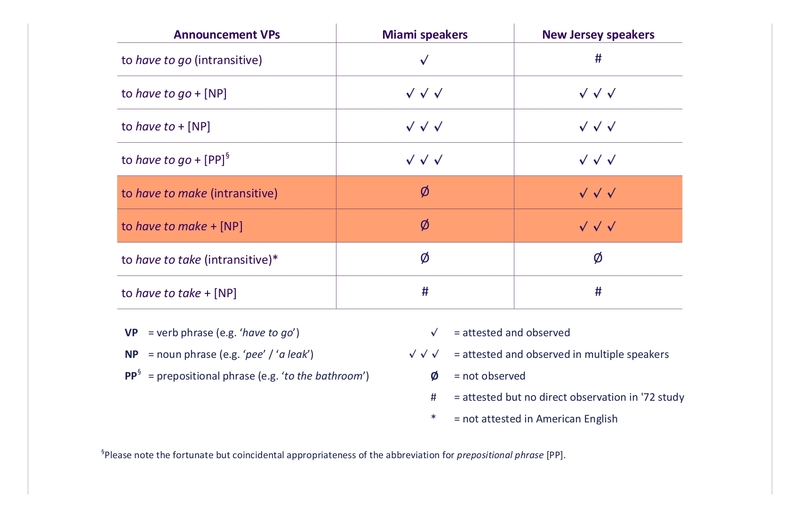 In my recent exploration of The Phoneme, I note that one way of conceptualizing it — as a (discrete) unit of sound — is complicated by the rest of its definition, that it is a class of speech sounds that a native speaker will identify as the same sound. An “individual” phoneme is actually a category containing multiple sounds, like Chaser’s categories toy, ball, and frisbee, the first of which contains not only the other two (as well as everything the categories ball and frisbee respectively contain) but another nearly 900 words in addition. Toy also functions to distinguish for Chaser what she is allowed to play with from what is off-limits, or not-toy. Similarly, the thing we call a phoneme is a category that contains qualitatively similar but not identical sounds that, despite their variability, native speakers of a language will interpret as close enough to one another so as to be (more or less) interchangeable without affecting meaning. In other words, the differences among them can be ignored. The 26 objects that Chaser knows as members of the class frisbee are not identical to one another, but if Chaser is anything like my border collie, Scarlett, she is probably willing to ignore the differences because all frisbees are good frisbees by virtue of their being frisbees — flying discs that are fun to run after and catch spectacularly — unless she is directed to select a particular frisbee for which she has learned a unique name. 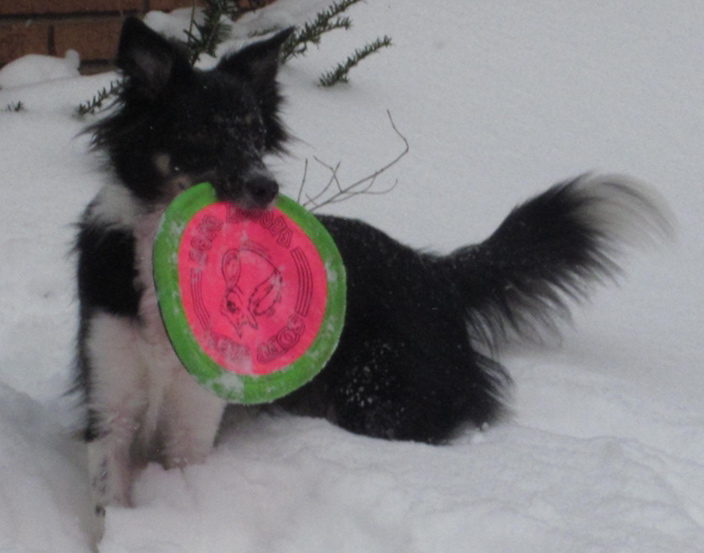 My girl Scarlett has a large collection of frisbees of various materials (e.g. canvas, plastic, rubber) and different colors. She doesn’t seem to care which one she plays with, as long as someone will throw it for her. 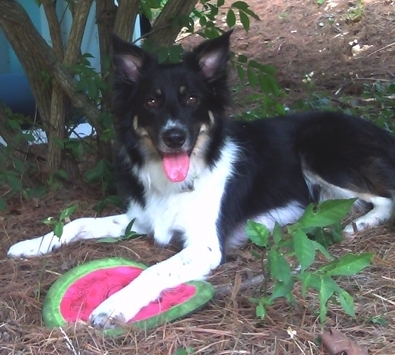 (Quinn, our Australian shepherd, on the other hand, shows a distinct preference for the firm plastic Wham-O brand Frisbees™, although he has not signed any endorsement deal that I am aware of, so this shout-out is on the house.) While it is sometimes possible for member-sounds (i.e. variant realizations or allophones) within a category or class of sounds (i.e. a phoneme) to sound less like some of the other members of its own class and more like sounds considered to be members of other classes, it seems much less likely that any frisbee could have more in common with any ball than with other frisbees. Based on her past behavior, I think there is pretty much no chance that Scarlett will bring back a ball when she is instructed to “go get the frisbee.” She’s never done that. She always brings back a frisbee. The apparently essential (to Scarlett, at least) frisbee-ness of flying discs notwithstanding, all categories — linguistic and otherwise — are going to be arbitrary to some extent. One of my favorite linguistic examples of this arbitrariness is the way certain realizations of speech sounds are considered members of separate categories (phonemes) on the basis of qualities that are language-specific, such as the quality in English that distinguishes /i/ (vowel in seat) from /Ι/ (vowel in sit): the so-called tenseness (/i/) or laxness (/Ι/) of the vowel, a quality that is phonemic in English but noncontrastive in Spanish, in which /i/ and /Ι/ are close enough. So, what does all this have to do with whether dogs can predict phonemic splits? Well, since there’s good evidence out there that dogs have the cognitive ability to determine and comprehend categories and that they can even understand and interpret language (in the form of meaningful combinations of human speech sounds) to do so, I am wondering about whether they understand phonemic categories in the same ways that human speakers do. Would a dog who grew up in an English-speaking household interpret a meaning distinction between sit and seat? Or would a dog who has been responding since puppyhood to the human-articulated instruction to “sit!” by doing just that hear the two words as close enough phonemically (and/or semantically) to respond the same way to an instruction to “seat”? Would a dog raised in a Spanish-speaking family to come running when given the instruction “ven!” (come!) — pronounced [ben] — respond in the same way to an American English-accented version of the same command that sounds like [vεn]? In Spanish, [b] and [v] (and also [β], although it is less commonly articulated at the beginning of a word) are allophones — variant realizations — of the same class of sounds, namely the phoneme /b/. In many varieties of Spanish, word-initial v is often pronounced [b] and rarely [v]. In English, /b/ and /v/ are two distinct classes of speech sounds (and words spelled with v are always pronounced [v] and not [b] by native speakers). The difference between /b/ and /v/ is thus phonemic in English, which can be demonstrated by considering a minimal pair like ban and van. Since the only difference between ban and van in terms of sound is in the initial consonant of each word, the difference in meaning — in English, ban and van are of course distinct words with different meanings — shows that the initial consonants are members of different classes of speech sounds, which is another way of saying that they are phonemically distinct. In Spanish, the difference between [e] and [ε] is also not phonemic; both sounds are allophones (variant realizations) of /e/. In English, however, the distinction between /e/ and /ε/ is phonemic, as evidenced by the meaning difference between the English words main [me:n] and men [mεn]. The other day, my husband and I were talking about whether dogs can distinguish between variant pronunciations of unstable sounds like /æ/, the vowel in the word cat, which is highly variable in American English partly as a result of the Northern Cities Shift (NCS), a set of apparently interrelated changes in vowel pronunciations. The epicenter of NCS is the Great Lakes region, where we have lived since 2004 after having spent most of our respective lives at various points along the east coast, from Florida (me) to Virginia (him) to Washington, D.C., North Carolina, and Georgia (both of us). Even after eight years here, to my ears, the differences between NCS and non-NCS pronunciations are so salient that NCS speakers sound to me like they are articulating a different phoneme from the one I use to pronounce words with the /æ/ sound. 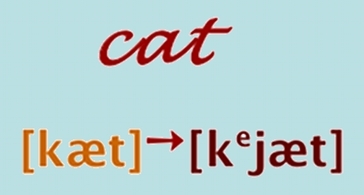 To me, their pronunciations of cat sound like [kejæt] (‘KAYat’) or [kiæt] (‘KEEat’), with the /æ/ noticeably (to me, anyway) raised and tensed and diphthongized. This is very different from my pronunciation, which has a slightly lowered and backed /æ/ that native Michiganders who hear the difference (they don’t all) hear as [kat] (a vowel sound closer to something that sounds to them like ‘KAHt’). Scarlett, who had been napping on the kitchen floor, immediately jumped up, dashed to the living room window, snapped to attention with her paws on the window sill, and looked for the cat. You may be thinking that this incident does not bode well for my hypothesis that dogs may be able to predict phonemic splits since it was clear that Scarlett completely disregarded what to me is a highly salient pronunciation difference that I can’t believe is not going to end up phonemically distinct sooner or later in American English. I should point out, though, that Scarlett has lived in Michigan for three years, since the age of 16 weeks, so she is as good as native to the region. This anecdote, while charming, is nowhere near enough evidence to go on, of course, but this post is getting long, so I will just say that in light of Scarlett’s enthusiastic response to my NCS articulation of cat (and the complete disregard it reveals on her part for what I consider a substantial difference from my usual pronunciation), it may be that dogs cannot predict phonemic splits, that they may not be any more sensitive to slight (cough) pronunciation differences than people are. But even American dogs are native speakers not of American English but of barking, growling, yelping, yipping, tail-wagging, and other vocal and nonvocal means of expression that categorically do not include American English or any other human language. And so even if they cannot predict phonemic splits, even if they pay attention to what we pay attention to and ignore what we ignore (linguistically, anyway), it is really quite remarkable that somehow they have learned to do that. Even if they are no more sensitive to phonological variation than the people who love them (or maybe they are but learn not to be), in a sense they are still demonstrating an impressive capacity for understanding that is not necessarily available to humans when we learn languages non-natively. This capacity may have to do with their cognitive and linguistic abilities, and it may be that they have ways of getting information that have not yet occurred to us (or at least not to me), possibly including the kind of information that can compensate for phonological variability and instability. All I can say for certain at this point is that however they do it, it is clearly another example of the all-around awesomeness of dogs. The photos of Scarlett in this post are my original work, as is the visual representations of ‘toy’ categories and the illustration of an NCS pronunciation of cat. I hold the copyright for all of images in this post, so please do not use any of them without permission. 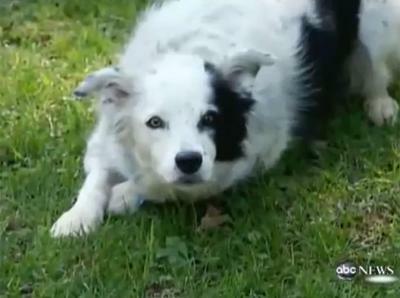 Border collies like Scarlett are known for their linguistic skills as well as their extreme cuteness. In my previous post, I wrote about a few of the many delights associated with the process of introducing undergraduate students to the discipline of linguistics. I observed that despite their overall tendency to acquire general linguistic terminology and the concepts they denote with admirable ease and considerable aplomb, a lot of the students find one key linguistic concept to be an ongoing source of torment, and that is The Phoneme. I won’t go into the definition again here, so if you need a refresher, please refer to that previous post. I will say that a key theme of that post was that the definition and functions of The Phoneme tend to be difficult for students to get their heads around and that it takes considerable persistence over the course of an entire semester for everyone to get to where they feel OK about it. This difficulty is completely understandable. The idea of the phoneme was initially conceptualized by structural linguists and the definition is thus fluid, relational, and complicated. On what is going to seem like but really isn’t a completely unrelated note, you’ve probably heard about this really smart dog from South Carolina, a border collie named Chaser, who in three years of training not only learned to understand over 1,000 English words but is also reported to be capable of referential understanding of the words. That means she actually demonstrates understanding of the connection between words and their real-life referents (i.e. she can connect a word with the thing it stands for), rather than merely processing the human articulation of a noun such as frisbee as a command to go get the object so named. The beautiful and intelligent Betsy. For example, when Rico was told to “fetch sock,” did Rico comprehend that the label “sock” referred to a specific object and separately comprehend that the word “fetch” meant that he should produce a specific behavior involving that specific object? If Rico actually treated the label “sock” as a command to “fetch sock” only, then it would not be evidence that he understood reference. That is, Rico may not have understood that the label “sock” referred to a specific object, independent of a behavior directed toward the sock. If so, then Rico’s word learning may have little to do with language learning as exhibited by humans. In essence, Bloom’s concern addresses the question as to whether Rico understood . . . that objects are independent in meaning from the activity requested [involving] that object. The adorable and brilliant Rico. 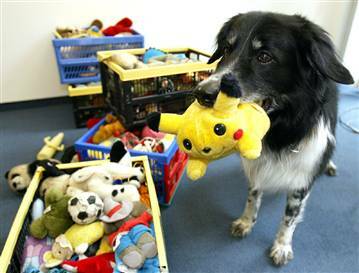 Four experiments investigated the ability of a border collie (Chaser) to acquire receptive language skills. Experiment 1 demonstrated that Chaser learned and retained, over a 3-year period of intensive training, the proper-noun names of 1022 objects. Experiment 2 presented random pair-wise combinations of three commands and three names, and demonstrated that she understood the separate meanings of proper-noun names and commands. Chaser understood that names refer to objects, independent of the behavior directed toward those objects. Experiment 3 demonstrated Chaser’s ability to learn three common nouns – words that represent categories. Chaser demonstrated one-to-many (common noun) and many-to-one (multiple-name) name–object mappings. Experiment 4 demonstrated Chaser’s ability to learn words by inferential reasoning by exclusion – inferring the name of an object based on its novelty among familiar objects that already had names. Together, these four experiments indicate that Chaser acquired referential understanding of nouns, an ability normally attributed to human children, which included: (a) awareness that words may refer to objects, (b) awareness of verbal cues that map words upon the object referent, and (c) awareness that names may refer to unique objects or categories of objects, independent of the behaviors directed toward those objects. Chaser has thus demonstrated not only that she is a very, very smart girl but also the referential understanding that was not conclusive in the earlier work with Rico. In other words, she has demonstrated that she understands the difference between a word that denotes an actual object and a command to go get the object. Additionally and astonishingly, Chaser comprehends categories to which different objects belong. She knows that toy means any one of the 1,022 things she is allowed to play with (and has individual names for) but she also recognizes ball as a subcategory to which 116 of the toys belong (by virtue of their being spherical and bouncy), each also with its own individual and distinct name, and frisbee as another subcategory of 26 of the toys, each with “disk-like qualities” (Pilley and Reid 2011: 191) and an individual name. In other words, Chaser understands the 26 member-objects of the category frisbee as individual items with a certain level of distinction from one another but she also understands that all 26 frisbee objects are collectively distinct from all the other non-frisbee members of the category toys. It is partly Chaser’s understanding of categories that got me thinking about whether dogs might be able to predict phonemic splits, which will be the topic of my next post, and partly my experience with Scarlett, my own adorable and astonishingly smart border collie, who responds to an array of verbal and non-verbal cues, most of which I am probably completely unaware although I am in awe of her just on the basis of the ones I am aware of. And it is partly my recent exploration of The Phoneme, which we talk about in some ways as if it is a discrete unit of sound, except that it is complicated by the rest of its definition as “a class of speech sounds that a native speaker will identify as the same sound.” The multiplicity of different sounds that can belong to such a class and be close enough to one another so that speakers will mostly ignore the differences between them functions in some ways like the differences among the 26 objects that Chaser knows as members of the class frisbee. But sometimes a sound within a category actually sounds less like other members of its own class than like some sounds considered to be members of other classes, while it is unlikely that any but the most questionably labeled frisbee is going to be more like any ball than like any other frisbee. What I am saying, then, is that I think frisbee and ball are more discrete categories than, say, [Ι] and [i], the vowel sounds in the words sit and seat, respectively, but it’s still pretty awesome that dogs can understand such categories at all. On that note, I am going to stop for now. But stay tuned for the gripping conclusion to what is going to have to be a trilogy because this post, part 2, is already up to 2,000 words, and there are still lingering questions about dogs, phonemes, and the arbitrariness of boundaries that have to be dealt with. So join us next time for The Phoneme and the Many Lives It Has Destroyed, Part 3: Can Dogs Predict Phonemic Splits? Bloom, Paul (2004). “Can a Dog Learn a Word?” Science 304, pp. 1605-06. Kaminski, Juliane, Josep Call, and Julia Fischer (2004). “Word Learning in a Domestic Dog: Evidence for ‘Fast Mapping’.” Science 304, pp. 1682–83. Markman, Ellen M., and Maxim Abelev (2004). “Word Learning in Dogs?” Trends in Cognitive Sciences 8:11, pp. 479–480. Pilley, John W., and Alliston K Reid (2011). “Border Collie Comprehends Object Names As Verbal Referents.” Behavioural Processes 86 (2011), pp. 184-95. The photo of Scarlett in this post is my original work and I own the copyright, so please do not use it without permission. I hope National Geographic won’t mind the use of their cover photo of Betsy and that ABC News won’t mind the inclusion here of their picture of Chaser. The photo of Rico used here is all over the internet and I could not find its original source. I hope that none of these pictures will get me into trouble with the law and that if anyone knows the original source for the picture of Rico, they will let me know so that I can cite it. So far on the blog, I’ve focused a lot of attention on the pre–history of the language and on the mostly 19th-century and mostly European scholars who conceptualized the study of historical linguistics into the approaches that many researchers in the discipline still accept and use even today. I’ve also alluded now and again to the relationship between language change and language variation, although these really have been only allusions rather than any kind of exploration of what I think is an interesting topic in its own right, one that I am looking forward to exploring in a future post. But what’s on my mind today is language variation as it occurs at a (relative) moment in time, how linguists have come to approach it as an object for analysis, and particularly how an approach known as linguistic geography came into being. This is a topic close to my heart for several reasons, all of which I think I will get to eventually in this post. Some 45,000 of Wenker’s questionnaires were eventually completed and returned to him, a rate of response that I probably don’t need to point out would be pretty much impossible to replicate. It also made it impossible for Wenker to analyze all the data during his lifetime. But he was able to publish some of his findings and is usually credited for creating the first modern linguistic atlas, literally documenting Who Said What Where, with the publication of his first Sprachatlas in 1881. 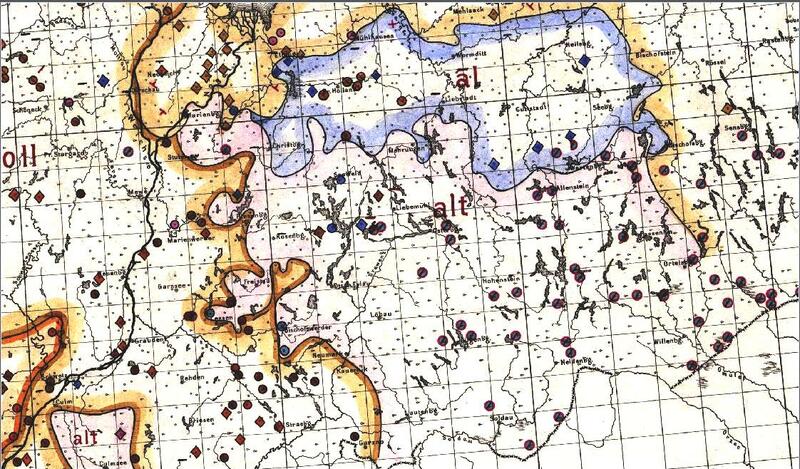 In collaboration with Ferdinand Wrede (Wenke’s successor as Sprachatlas project director) and Emil Maurmann (about whom I could find out practically nothing), Wenker also used the data to create original hand-drawn maps, thereby putting the ‘atlas’ in Sprachatlas and illustrating the locations where particular linguistic features had been attested. The pioneering linguistic geographer and his colleagues eventually created over 1,600 such maps, a phenomenal feat of cartography, not to mention an equally impressive artistic achievement. Wenker map of ‘ald’/’al’ variants (English ‘old’). Wenker’s reliance on the self-reports and observations of the research participants rather than first-hand observations by trained linguists open the data to challenges from later researchers, but his project was an influential model for linguistic geography into the 20th century. Another key figure in modern language variation studies is Jules Gilliéron (1854-1926), a Swiss linguist who hiked around the southern Rhône valley region to study the speech of the locals in this French-German-Italian contact area for his 1880 Petit Atlas phonétique du Valais roman (sud du Rhône) and later trained Edmond Edmont (1849-1926) to collect linguistic data in France. The lucky Edmont’s job combined two of the best things in life – biking and linguistics – and he cycled around France from 1896 to 1900 in the process of interviewing 700 speakers using a 1,500-item questionnaire. 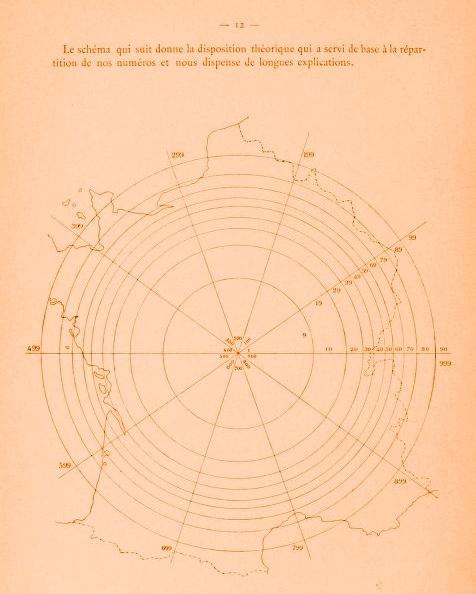 He and Gilliéron published the results along with nearly 2,000 maps in the 13-volume Atlas Linguistique de la France (1902-10). The work of Gilliéron and Edmont was influential, especially their methods of direct observation (versus Wenker’s reliance on indirect reporting). Several more European projects were soon underway, most notably the Sprachatlas Italiens und der Südschweiz (Linguistic Atlas of Italy and Southern Switzerland), published in 8 volumes (1928-40), by Karl Jaberg and Jakob Jud, who had both been students of Gilliéron’s. 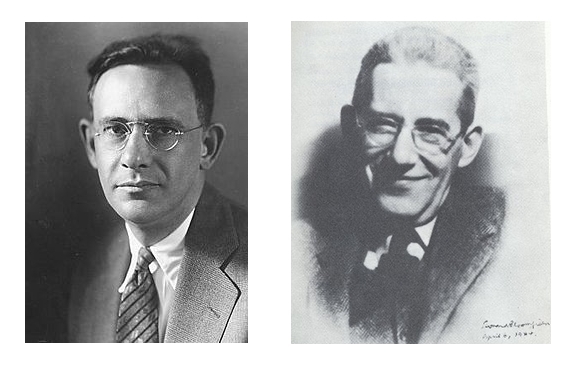 In 1931, Jud traveled to the U.S. with Paul Scheuermaier, who had also worked on Jaberg and Jud’s Sprachatlas, to train American students in linguistic field methods. The Americans who trained with Jud and Scheuermaier would soon head out to begin fieldwork (1931-33) for the Linguistic Atlas of New England (LANE), under the direction of Hans Kurath (1891-1992). Kurath, then a professor of linguistics at Ohio State (later Brown and finally the University of Michigan) had been appointed in 1930 to head up a new project, the Linguistic Atlas of the United States and Canada. LANE was to serve as the pilot study and was published in three volumes (1939-43), none of them available online. 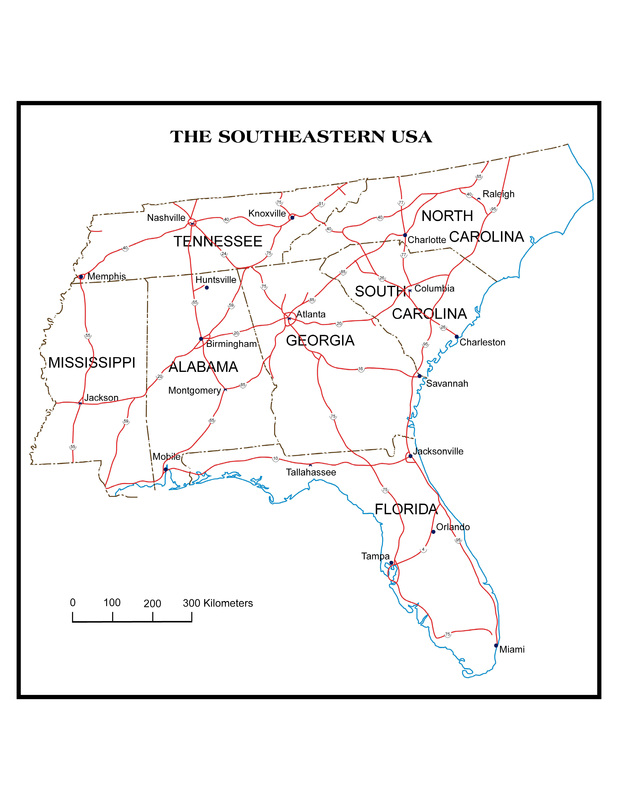 Linguistic Atlases of the Middle and South Atlantic States (LAMSAS), North Central States (LANCS), Pacific Northwest (LAPNW), Gulf States (LAGS, directed by one of my all-time favorite people, Lee Pederson), and other regional Atlas projects would follow. Raven I. McDavid, Jr. (1911-84), then a graduate student at the University of Michigan, joined the Atlas as a fieldworker in 1940 and proceeded to conduct interviews of 278 LAMSAS participants, most of them in his native South Carolina. When Kurath retired in 1964, McDavid, by then a professor at the University of Chicago, assumed the directorship of LAMSAS and LANCS. Fieldwork continued on both projects through 1978, which was just around the time that a young doctoral student at Chicago, Bill Kretzschmar, joined the project. When McDavid died in 1984, Kretzschmar, who had recently joined the faculty at the University of Georgia, was appointed to succeed him as project director. Kretzschmar brought the Atlas into the 21st century by digitizing substantial portions of LAMSAS data, including the linguistic data of speakers of Sea Island Creole, or Gullah, an endangered contact language spoken on islands off the coast of the southeastern United States, collected and transcribed by the legendary scholar and linguist Lorenzo Turner (1890-1972). Kretzschmar has also launched new community language projects and continues to work on new ways to make more Linguistic Atlas data available online. It was 1989 when I first ventured into 317 Park Hall at the University of Georgia. I was looking for a professor I hadn’t met before whose name contained an astonishing six consecutive consonants. I was trying to put together a committee for my master’s thesis on how speaker gender is perceived to influence linguistic behavior. I had a thesis director and was now looking for a few other interesting linguistics professors to work with. The rest isn’t quite history. I finished my thesis and my master’s degree only after some fairly insane departmental drama that makes a lot more sense to me now, was completely horrifying at the time, and resulted in Dr. K’s having to take over as director of my thesis, which he did more graciously than I probably deserved and more competently than I had previously had reason to imagine possible since I had only my former director’s example to go on. When I wrote to him years later to tell him that I was planning to go back to school to pursue a PhD, Dr. K did not hesitate: “You should come back here,” his email said. 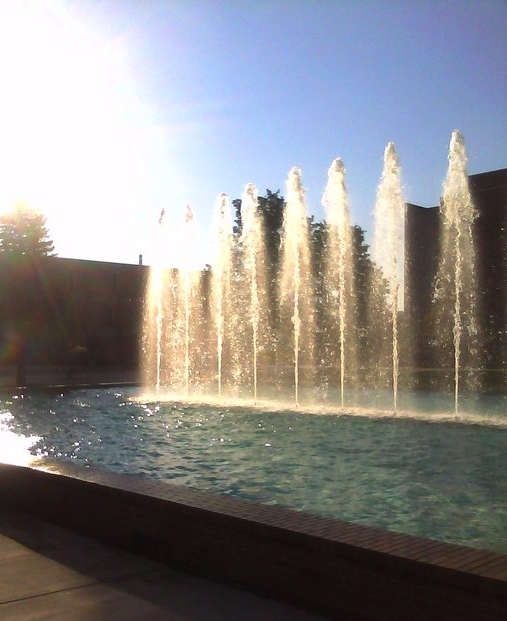 In 1998, I returned to the University of Georgia to begin my doctoral work and start a job in 317 Park Hall. Thanks to Dr. K, I got a university-wide research fellowship that funded an editorial position with LAMSAS. My job was to compile and edit headnotes, train undergraduate researchers, and especially work on getting the data of African American and Gullah interviewees online. This meant that I got to work with the handwritten field transcripts, the pages of phonetic transcriptions that the fieldworkers had made on the fly, documenting pronunciations, lexical variants, and grammatical forms as they interviewed LAMSAS participants. Lorenzo Turner’s were clear and beautiful, sometimes including notes about cultural customs and drawings of local plants; Raven McDavid’s were lightly pencilled and impossibly meticulous, sometimes nearly impossible to interpret, the phonetic symbols often marked up with diacritics to within inches of their lives, attesting to the slightest of pronunciation differences among speakers. I have never been a believer in destiny. It makes more sense to me to look back after the fact and see what patterns might have emerged as things more or less worked themselves out. And that might actually be part of what is appealing to me about the study of language, especially variation and change: the interesting designs you can see when you look back over things that happened over the history of a linguistic feature or of a language, the opportunity for interpretation, for the analytical and creative acts of developing a narrative to explain how whatever it is got that way. Unlike the Neogrammarians, though, I don’t believe in a systematicity or regularity to the processes of change or the patterns of variation. I can understand the appeal of that idea — it has an almost spiritual awesomeness (in the traditional sense of the word) about it that is very compelling — but I just can’t believe that it really works that way. And even if it does, I imagine that the design, the system, will never be within human comprehension, although that isn’t a good enough reason to stop looking for it, if you believe it is there and can be found. But I like the idea of there not being one, or of it being so incomprehensible to us that there might as well not be one. That’s almost as good. Anyway, I don’t believe that I was destined to become a linguist. I’ve always been fascinated with the way people talk, the way words sound, and how we make meanings out of collections of sounds. In that respect, I always wanted to be a linguist. Even before I ever knew there was such a thing. But I could have always wanted to be any number of other things, too, and had a few things gone even just a little differently, this would be a completely different story. When I look back now, after the fact, over the patterns that are there now for me to interpret, to analyze, and to create a narrative to explain, I do see kind of a design, an irregular one, not a logical one, that zig-zags and curlicues between the work that has become so important to me and my first language variation research project. 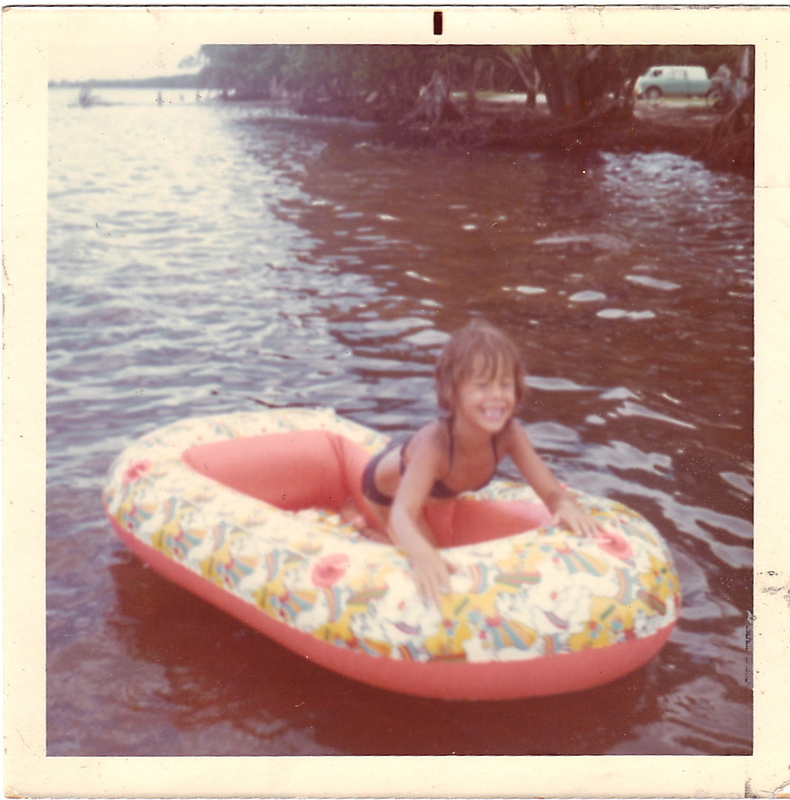 The author on a break from linguistic fieldwork (Miami 1972). When I was in second grade, a family from New Jersey moved into my neighborhood in South Miami. I noticed a lot of differences in the ways that they talked from what I was used to hearing, but I was particularly taken aback by their bathroom announcements, that is, what they said when they were going to use the restroom. The main feature I noticed was that while I was used to speakers focusing more on the going, the members of this family included disturbing information about what they were going to do when they got there. This startled and perplexed me. So I started paying attention to what people said when they said they were “going to the bathroom.” I listened to friends, family members, strangers I was lucky enough to overhear (I had to try to guess where they came from). I had family members in New Jersey, too, so I also got to listen to how my cousins talked when I was with them. I wrote down what I heard on a chart I kept in my notebook for school, keeping track of who said what where. This project went on for months. I discussed it with no one. In the table below, I reconstruct my findings to the best of my recollection. You will probably need to click to enlarge it in order to see it clearly. I make no claims as to the validity of the study’s methodology or findings. All images in this post are in the public domain, except for the Miami Bathroom Announcements data chart, which is my original work, and the photo of me, for which I own the copyright. Neither may be used without permission. In my previous post, I wrote about coming to terms with the metaphorical nature of Proto-Indo-European (PIE), a language that may or may not ever have existed as an actual language spoken by actual people at an actual moment in time but that is posited to be the common ancestor of most of the languages of Europe and many in western and central Asia. To recap, the gist of that post is that the Indo-European (IE) hypothesis is large and contains multitudes and that the options seem to be to accept the astonishing inexactness of the metaphors or submit to the paralyzing mind-blowingness of what we use them to try to explain. I also suggested that the latter option could be inconvenient if you’re trying to discuss historical linguistics and language relatedness in a class that meets for an hour and fifty minutes twice a week. Anyway, continuing on the topic of the metaphors that we use to try to create some kind of manageable order out of the chaos that is the story of human language and how it got this way, we turn now to a fellow name of August Schleicher (1821-1868), a German linguist by training and profession who specialized in classical and Slavic languages. Schleicher, who may have had some of the same concerns that I have about how we can possibly even try to conceptualize an unattested 5,000 to 7,000-year-old super-ancestor Ur-language that might not even have actually existed, decided that it was time someone got around to the task of trying to reconstruct Proto-Indo-European. That means recreating (creating?) more or less an entire language — vocabulary, phonology, grammar — by working backwards from existing linguistic data found in the oldest surviving texts in languages believed to be descended from PIE. 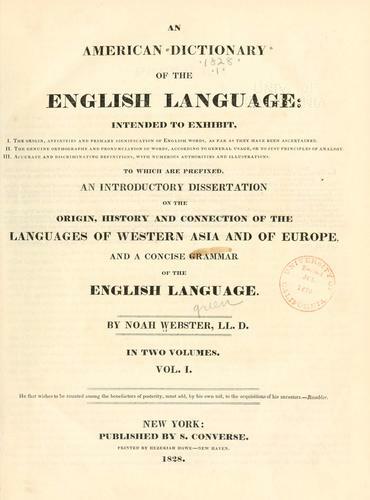 Anyway, in 1861, Schleicher published his reconstruction of PIE in a book called Compendium der Vergleichenden Grammatik der Indogermanischen Sprachen, known in English (and available in translation here) as A Compendium of the Comparative Grammar of the Indo-European Languages. Revisions and reissues appeared well into the 1870s, although Schleicher himself died in 1868 at age 47. “What does all this have to do with metaphors?” you might be thinking. Everything. It has everything to do with metaphors. For one thing, even as Schleicher published his reconstruction of a 5- to 7,000-year-old dead language that might not have existed in the first place, he also made it clear that he knew all along that he was dealing in metaphors, and particularly in a big PIE-shaped metaphor, one that made it possible for him to reconstruct what was quite possibly a mythical language. “A form traced back to the sound-grade of the Indo-European original language, we call a fundamental form,” he wrote in his extremely compendious Compendium in 1861, although of course he actually wrote it in German. “When we bring forward these fundamental forms, we do not assert that they really were once in existence.” I mean, duh. But that’s not all. As if the actual reconstruction of a possibly metaphorical language is not enough to guarantee Schleicher’s place in history, or at least his place in historical linguistics, or at least in the history of metaphors to explain historical linguistics, there is also this: August Schleicher generated some of the most influential and enduring metaphors to which we have recourse today for making sense of the development of human language over time, including the single most influential and enduring metaphor of all: the phylogenetic tree for mapping language descent and relatedness. (That his tree metaphor has been criticized and challenged from practically day one and continues to be qualified to within inches of its life even today ought to take nothing away from the fact that it is actually still used today.) 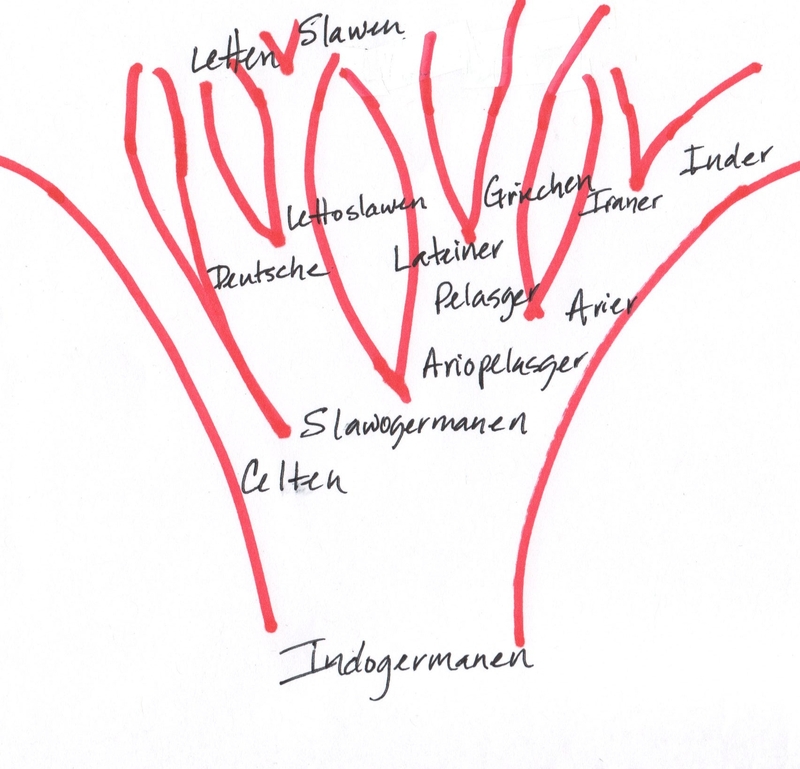 This was and still is the family tree theory, which Schleicher devised to explain relationships among languages and thereby to classify them, although he actually called it Stammbaumtheorie, which is German for ‘family tree theory’ (sort of), because he was, you know, German. 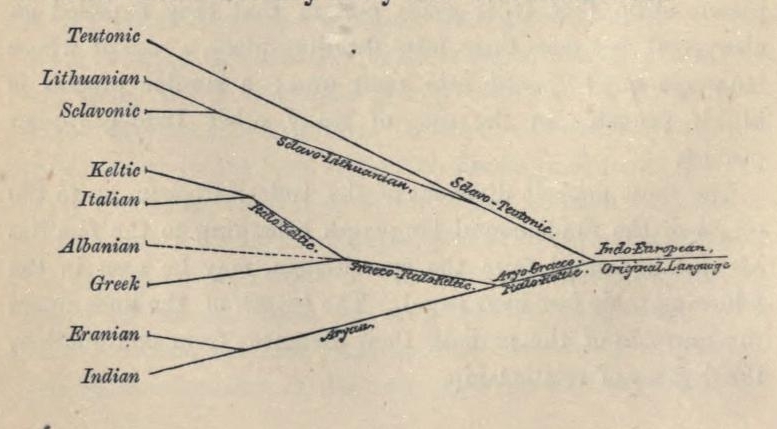 According to Richards (2002: 34), Schleicher “suggested (but did not yet graphically illustrate) that the developmental history of the European languages could best be portrayed in a Stammbaum, a stem-tree or developmental tree” as early as 1850. His first “graphic representation of a Stammbaum” appeared in two publications in 1853. Unfortunately, neither of the two 1853 articles in which Schleicher’s proto-tree proto-drawings (see what I did there?) first appeared is readily available, so I had no choice but to copy — as in reproduce by trying to draw it myself — an image of one of them that is conveniently reprinted in Richards’s article, which is itself actually Printed in a Book that is Protected by Copyright. Even though Schleicher’s original work is of course in the public domain, reprinting it in a book in 2002 might give a publisher a sense that they are entitled to righteous indignation as well as legal recourse were someone to, say, scan the image and put it on the internet. Hence my original interpretation. By 1860, Schleicher “had begun to use Stämmbaume rather frequently to illustrate language descent,” according to Richards (34). And his designs get more sophisticated as well in the 1860s, meaning that he seems to have used a ruler this time, as you can see in the illustrations below, which appeared in the extremely compendious Compendium, in the original German version (1861) and the English translation (1874), respectively. Schleicher’s family-tree theory includes two key hypotheses, and both are pretty Neogrammarian (as in kind of obsessed with the idea that language change, particularly sound change, is regular, systematic, and predictable). He is not technically identified with that movement, although there is no question but that he influenced its proponents. Anyway, the first was the regularity hypothesis, which assumed that speech sounds change in systematic (regular, predictable) ways, as Rasmus Rask had originally suggested. (There’s more about Rask in the previous post.) The second hypothesis was the relatedness hypothesis: Because of this (assumed) regularity, sound similarities among particular languages were therefore likely to be the products (and evidence) of family relationships (genetic relationships, to use another biological metaphor) among those languages. This was pretty innovative thinking, and the best part is that had Schleicher not had an actual life outside his work at the university (now there’s an idea), he might never have come up with any of it. As he explains in the essay, by this point in his career, Schleicher had come to conceptualize languages in the context of the natural sciences, about which he read avidly and which developments he had followed with great interest for most of his life. In the essay, he maintains that human languages are essentially living organisms that are born, grow into maturity, and eventually die. This is a reasonable enough metaphor, even a pretty good one, but interestingly, and despite the apparent predisposition for metaphor that his reconstruction of PIE and invention of the Stammbaumtheorie might indicate, Schleicher does not appear to treat the language-as-organism metaphor as, you know, metaphorical. 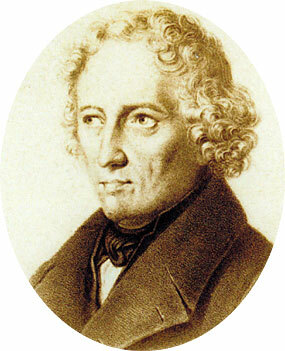 He had once suggested as much, in a book he published in 1853, Die Sprachen Europas in systematischer Uebersicht (The Languages of Europe in Systematic Perspective), but by 1863, he was no longer saying merely that languages are like living organisms but rather that languages actually share biological characteristics with plants and animals, at least in the evolutionary sense. 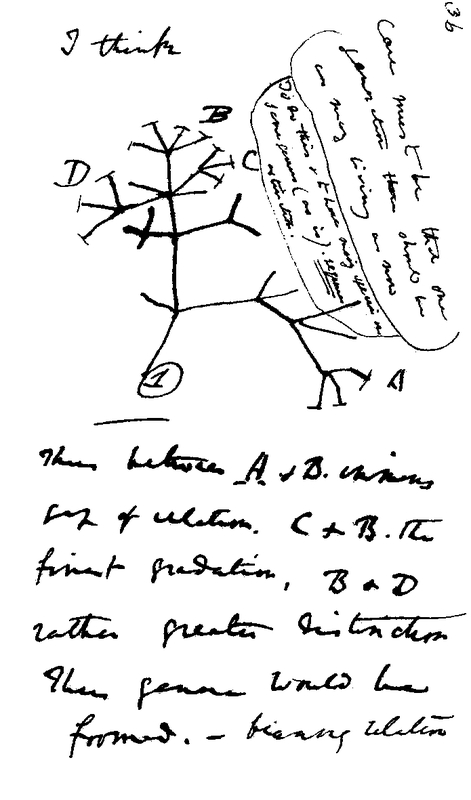 Richards (2002: 47) maintains that Schleicher and Darwin, who corresponded, were mutually influential and that Schleicher’s tree designs impressed the naturalist, who cited Schleicher in The Descent of Man (1871: 56) as a source for his exposition on the “origin of articulate language.” However, it turned out that Schleicher’s position, that “The rules now, which Darwin lays down with regard to the species of animals and plants, are equally applicable to the organisms of languages” (Schleicher 1863: 30), which he seems to have meant literally, did not prove to be very persuasive to other historical linguists, although it has enjoyed some considerable success as — you guessed it — a metaphor. So here we still are, still talking about the Indo-European hypothesis, and still using Schleicher’s models of language relatedness and descendancy, still applying the language-as-organism metaphor and the family-tree model as ways of conceptualizing the otherwise unimaginable. Like Indo-European languages themselves, Schleicher’s metaphors, the ones he intended as metaphors as well as the ones that just turned out to work better that way, have ended up having pretty serious staying power. 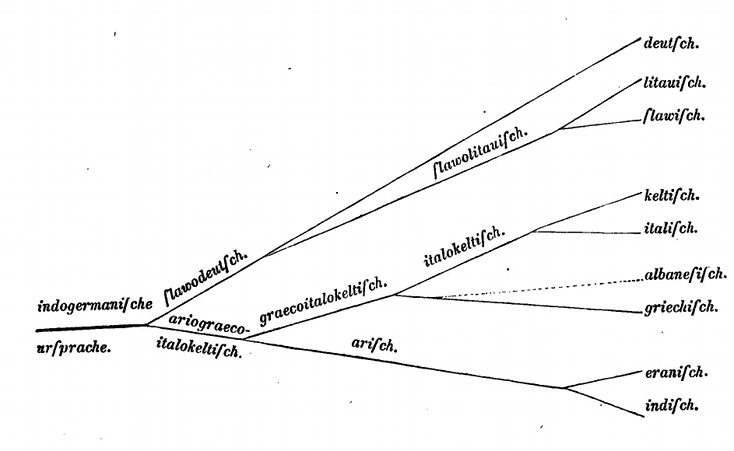 And despite its limitations and imperfections (it is not well suited to account for internal variation and contact between the branches that represent sub-families, for example) the central symbol of all his metaphors — the tree — has thrived beyond what even the dedicated botanizer-linguist could ever have hoped or imagined. You want to see some evidence of that? Click here to see a selection of the infinite visual representations of the Indo-European language family, all of which are in the debt of one August Schleicher. All images in this post are in the public domain, except for my rendition of Schleicher’s 1853 proto-tree, which is my original, um, artwork(-ish). Over the past few weeks, we’ve been exploring the idea of language relatedness in my English 3720 class, the topic of which is the history of the English language. I have been teaching this course once or twice a year for the past seven years, and one thing strikes me every time, especially at this point in the semester: the nature of the metaphors we use to talk about language, especially (although not exclusively) in the context of historical linguistic development and language relatedness. 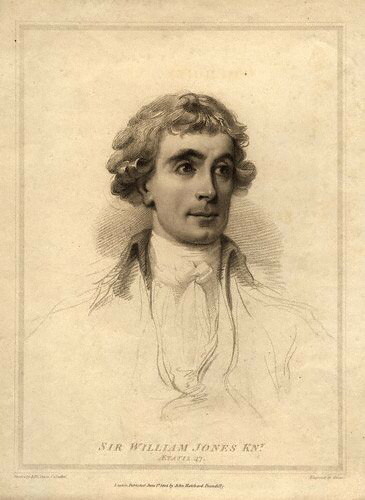 An English guy named William Jones (1746-1794) usually gets the credit for suggesting that similarities among languages in Europe and in western and central Asia – Sanskrit, ancient Greek, and Latin were Jones’s particular interests – could be explained by a common linguistic ancestor. As the story generally goes, Jones, who spent much of his professional life in India as a supreme court justice, presented the common-ancestor hypothesis at a 1786 meeting of the Asiatic Society, a scholarly society that he founded in 1784. The theory has since become known as the Indo-European (IE) hypothesis and the posited common-ancestor language as Proto-Indo-European (PIE), although Jones’s role in the development of the Indo-European hypothesis is not universally accepted and has been disputed by some scholars. In the 19th century, research in historical linguistics took a Germanic turn (in several senses) when German and Scandinavian philologists took up the topic of language relatedness. The interest of German(ic) linguists in the Indo-European hypothesis was a lucky turn for anyone who might have been hoping for a lot of new knowledge about the English language because these fellows had a tendency, not surprisingly, to focus on Germanic languages, of which English – as I think I might have mentioned in a previous post – is one. 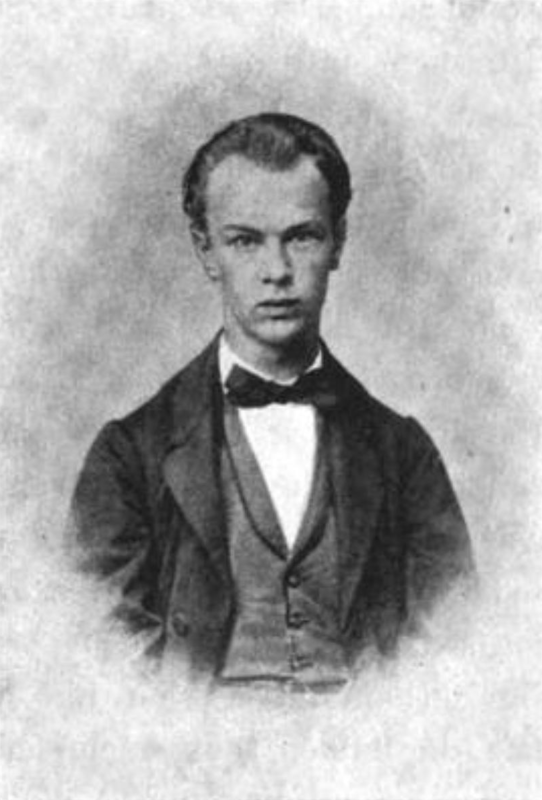 The awesomely named Franz Bopp (1791-1867), a German linguist, further developed the Indo-European hypothesis by considering Indo-Iranian (Persian) and Germanic languages along with Sanskrit, Greek, and Latin in an 1816 monograph that may or may not have been as long as its title, which was Über das Conjugationssystem der Sanskritsprache in Vergleichung mit jenem der Griechischen, Lateinischen, Persischen und Germanischen Sprache (“On the Conjugation System of Sanskrit in Comparison with that of Greek, Latin, Persian, and Germanic”). 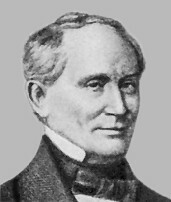 Rasmus Rask (1787-1832), a Danish brainiac and polyglot (although ‘polyglot’ isn’t really a strong enough word for a guy who was proficient in over 20 languages and by some accounts had a working knowledge of as many as 50), was instrumental in advancing and legitimizing the comparative method for analyzing the historical development of languages, determining ancestry and relatedness, and reconstructing old languages with little or no primary-source data, advocating an approach that assumes that language change, particularly sound change, is regular and systematic. His work anticipated as well as influenced the thinking of a number of influential linguists, mostly German, who came along later in the 19th century and who were known as the Neogrammarians. More on them later. 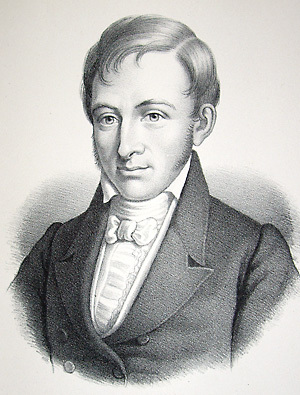 Rask published his first book, Introduction to the Grammar of the Icelandic and other Ancient Northern Languages (1811), at age 23 and wrote at least a dozen more during a short life that ended about a week before his 45th birthday. He wrote on a wide variety of linguistic and literary topics, especially on Germanic languages like Old English, Modern English, Frisian, Old Norse, Faroese, and his native Danish, but he also wrote books on Spanish, Italian, Sinhalese (spoken widely in Sri Lanka), Avestan (an ancient member of the Indo-Iranian branch of the IE family), and North Saami, a non-Indo-European language spoken today by about 25,000 people in northern areas of Finland, Norway, and Sweden, among others. Rask was also instrumental to the process of identifying Germanic languages as members of the Indo-European language family and, incidentally, of classifying English as structurally Germanic. He did this by noticing and demonstrating in 1818 a set of interconnected consonant changes that occurred about 2,000 years ago and distinguished Germanic languages from others in the Indo-European family, although another guy gets most of the credit for it today. There’s a little more to it than that, as well as some exceptions that had to be accounted for, but I did say that I would spare you the long version of the story. So I will keep it short except to note that those exceptions did have to be accounted for, because the Neogrammarian philosophy flowering among linguists at the University of Leipzig in the late 19th century could “admit no exception,” as one hardliner put it, to what they asserted was the absolute regularity of sound change. 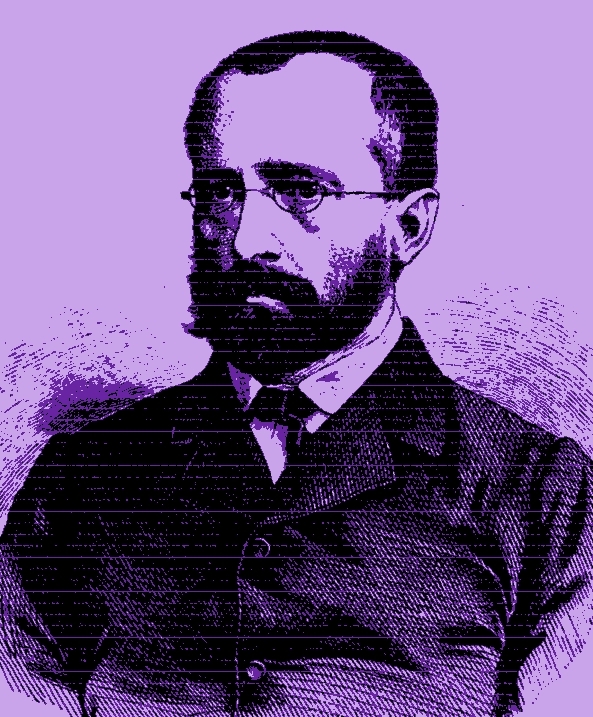 It was another Neogrammarian, Karl Verner (1846-1896), who accounted in 1875 for the apparent exceptions to Grimm’s Law and revised the “no exceptions” position to say that there could be “no exception without a rule” to explain it. So, fast-forward 136 years from the establishment of Verner’s Law, and we have a ton of good information now about the history and relatedness of Indo-European languages and the place of Germanic languages, including English, in the IE family. But the idea of PIE itself still remains mostly a metaphoric prop. It is more a way to try to make sense of something that so far remains firmly in the ‘unknowable’ column (although it sees plenty of action in the ‘theorizable’ column) than an actual unified language that was actually spoken by actual people at some actual point in time. As a language variationist by training, meaning as someone who conceptualizes variation and change as constant and defining features of living languages, I sometimes find it hard to justify (to myself, even) some of the compromises I have to make in order to teach concepts that can otherwise be difficult for students (and for me) to get their heads around. I do try to be up front about it, though, and explain to the students that I am asking them to join me in suspending our disbelief, that I think it’s important for us to be conscious that we are in fact having to suspend disbelief and also for us to talk about why we have to, and that I haven’t yet been able to figure out a way for us not to have to. When we talk about PIE, we are going for convenience, for the short version, using a word (PIE) or a phrase (Proto-Indo-European) that refers not to a single, discrete language (if there even is such a thing) but to a multitude of meanings — overlapping, complementary, contradictory — to save us the time and trouble of stopping and pondering what all is contained within that word or phrase because if we did stop to ponder it, there’s a good chance that we would never have time for anything else. So PIE is a relief, a tool, a technological development that saves us the trouble of risking a time-consuming mind-blow every time we need to refer to what were probably a lot of different ways of speaking that varied across space, probably to the tune of thousands of miles, and over time, possibly even thousands of years, but that still are somehow, at least metaphorically, one. And not just any one, but for us the one: Proto-Indo-European, the one that gave rise to so many other ones: Greek, Bengali, Portuguese, Czech, Kurdish, Icelandic, Hindi, Spanish, Russian, Armenian, Yiddish, Latin, Afrikaans, Welsh, Catalan, Pashto, French, and English, to name a few. Some of them are still living and some are lost to the past, but even many of those lost languages have traces remaining somewhere in the approximately 440 Indo-European languages spoken in the 21st century by literally half the population of the planet Earth. I think about this metaphor and ask the students to think about it (and about others we use in class) as a kind of “rounding off,” roughly analogous to the way that we can do quick mathematical calculations of large numbers by rounding them off, trading off precision for speed and getting somewhere that probably isn’t anywhere near close enough but we pretend it is because we have no choice. (One metaphor explains another.) There had to have been variation during the millenia that PIE is hypothesized to have been extant because there is always variation. Even in a classroom with 30 people in it, of whom 25 have lived their whole lives so far within a few hundred miles of one another, there is always significant variation. The students usually don’t notice that much of it at first; like all speakers of all languages, they have spent their whole lives becoming proficient at instantaneously distinguishing between differences they need to pay attention to and the ones they can ignore. But most of them eventually become very, very good at noticing and describing even relatively slight differences among speakers. On the other hand, the variation within what we conceptualize as ‘PIE’ was probably over time and across locations so great as to have meant mutual unintelligibility among its (possibly imaginary) speakers. So in essence, in teaching the Indo-European hypothesis, I am asking the students to imagine and accept as a kind of reality an idealized version of a language that nobody ever really spoke, to make a deal with me to treat the abstract as absolute, even though we know it isn’t. Not even close. And yet. Our metaphoric treatment of the Indo-European hypothesis does not end here, although I am going to end the post here because as usual I have no answers. Historically, the mysterious metaphorical magic of the Indo-European hypothesis is just getting started. So look for Part 2 of Let Them Eat Metaphors: Darwin and Schleicher Sitting in a Tree, in which we consider August Schleicher’s 1861 reconstruction of Proto-Indo-European and the enduring power of biological metaphors for language. As I’ve mentioned elsewhere on this blog, my current research project explores vernacular speech in American literature and considers how it functions in relation to the development of language attitudes in American culture. For such a young country, we’ve got some pretty deeply entrenched language ideologies, and the literary arts seem to have both informed and been informed by the development of a specifically American language consciousness. And really, I’m thinking that American literature and the literary dialect that shows up in it, especially in the 19th century, are part of the story of how American English came into being. By “American English,” I don’t mean a distinct language variety but an idealization, a cultural discourse generated in the context of a developing language consciousness that was itself a product of a post-Revolutionary political consciousness about what it means to be American. (Spoiler alert: I don’t know what it means to be American.) As I discussed in an earlier post, public conversation about what “American English” ought to be – starting with the idea that in fact it ought to be – was well underway by the 1780s. Part of what I am doing with this research project is looking at the way language consciousness informs literary and other public discourse from the early years of the republic and embeds itself in the process of defining distinctly American political, linguistic, and cultural traditions. The notion of what constitutes a “national identity” is part of my research question, which is to say that I haven’t got an answer to that one yet, but I am pretty sure that work can be done (and was done) to try to create and project a national identity without anyone knowing or agreeing on exactly what that might mean and even without anyone necessarily realizing that’s what they’re doing. For the moment, for this post, a question I am thinking about is how “vernacular” or “dialectal” varieties of language acquire that status, which I guess is really to say how “standards,” i.e. the preferred varieties of language, get their status. In some ways, the answer to this question is fairly obvious, as I will discuss below. But for the larger project, I am interested in specific things that got said and written and done in the early days of the republic and into the 19th century, overtly as well as subtextually, to establish the relative and differential statuses of language varieties, and that’s where the analysis of literary dialect and other writing, especially about language, comes in. For right now, though, meaning today, I am thinking big-picture with respect to the establishment of a preferred standard for American English. As I wrote in the earlier post that I keep mentioning, several influential 18th-century advocates for American independence maintained that it could not be fully achieved without the establishment of a national language. As the lexicographer and patriot Noah Webster (1758-1843) put it in 1789, “Our honor requires us to have a system of our own.” As I also noted in that post, developing a new linguistic system for exclusively American use would have been a challenging task in a new nation whose ruling class consisted primarily of English-speakers trying to establish their independence from a bunch of other English speakers, and I suggested that therefore their best alternative was to find ways to differentiate American English from British English. I also suggested that one way of doing so would have been to identify and institutionalize a standard for American English on the basis of linguistic features (pronunciation, vocabulary, orthography) that were beginning to be associated with speakers in the US, features that by the late 18th century already encoded some of the inevitable differences that would arise between the Englishes of the two nations because of their lack of geographical proximity. For example, Webster advocated a complete overhaul of the English spelling system for American English, which in his view would not only help differentiate American English from British but would also in the process solve the messy problem of the idiosyncratic and non-phonetic spelling system for which English is still dubiously renowned. And as we’ll consider below, he was also keen on the idea of actual usage as the appropriate source for standard forms. As I am generally fond of pointing out, authorization of a Standard American English (SAE) resulted from the institutional privileging of the language varieties spoken by people endowed with power and authority, although that’s probably not how its most enthusiastic proponents would have explained it then or understand it now. And of course, that is pretty much how it always goes down when standard varieties are institutionalized. It’s not like American English has the market cornered on this one; far from it, in fact. Webster made the case in Dissertations on the English Language (1789) for a standard based on “all the certainty and uniformity which any living tongue is capable of receiving,” which I don’t think he intended as a joke even though that sounds kind of hilarious to anyone with knowledge of historical linguistics, because they know that the sum of uniformity and especially certainty is only slightly greater than zero in any living language (and, it may go without saying, they also obviously have fairly low standards for humor, but this is only because there aren’t nearly as many good linguistics jokes as you might think). Webster also seems to have anticipated the kind of linguistic anxiety that still prevails among his countrymen and women in the 21st century; early in the Dissertations, he warns that a national failure to standardize American English could result in “inaccuracies” which could then “corrupt the national language” (18-19). But to be fair to Webster, I have to point out that his language attitudes were complicated and interesting, that he wasn’t a pedant or a snob or an authoritarian prescriptivist who thought he owned the language and that he could therefore just make up whatever idiotic rules he liked regardless of how linguistically indefensible they might be and then try to force everyone else to go along with his own quirky preferences. Dissertations is a collection of really smart, interesting, well-informed essays about English pronunciation and grammatical structure, orthography, the history of the English language, the origins of language in general, and theories of language relatedness, among other topics. The guy knew a lot about linguistics and about the English language, and he was also a pretty damn good writer. But it’s not easy to characterize Webster’s language attitudes, at least not in any categorical way, because they are sometimes inconsistent and even contradictory. Of course, that’s a selling point as far as I’m concerned, because I like how despite his astonishing expertise, he is thoughtful, judicious, and reasonable and rarely gives in to the dogma that tempted so many of his colleagues (and continues to torment English speakers and learners today). I like even more how he works as an unselfconscious and dynamic character in the story of American English, which he tells in a way that holds up even after 200+ years. He’s a guy who’s OK with nuance and doesn’t back down from paradox. 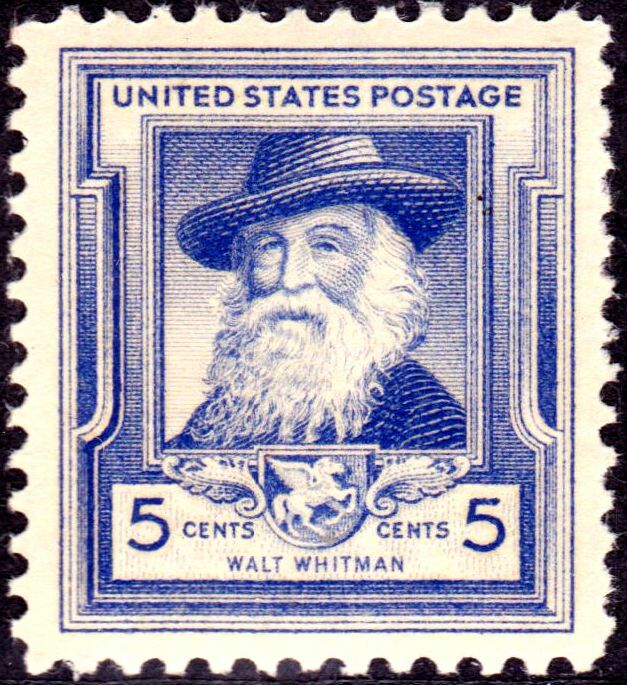 He would have been a man after Walt Whitman’s heart, an explorer of his own contradictions. Webster is large—he contains multitudes. Like his dictionaries. If only the ridiculous and pedantic could have been as few as he predicted. Anyway, to some extent, Webster’s own beliefs about standardness, as well as the developing cultural discourses and language ideologies to which he gives voice are inherently contradictory. But then, so much about standard-language ideology is contradictory. For one thing, despite its socially privileged position, Standard American English has no real identity of its own. Its existence depends entirely on the existence other ways of speaking that are not standard. It is identifiable not by any characteristics of its own but only by what it lacks: stigmatized features, the existence of which it depends on for its own value and status. This is ironic given the resources spent on the teaching of SAE and the perpetuation of its ideology, i.e. that it has intrinsic value above all other varieties of American English, that therefore its speakers have greater value as well, that everyone should speak SAE or at least want to, and that all other varieties should be eradicated. Apparently it is terribly distressing to some people who value SAE to have to be subjected to the use of nonstandard features. It must be distressing because why else would some defenders of SAE seem to feel that they have no choice but to be unkind in response? (See the links above and below for evidence if you doubt this.) But if the efforts to eradicate nonstandard varieties were to succeed, there would no longer be any status at all attached to SAE, which could be a disappointing turn of events for some of its champions, for whom feeling superior to others is apparently part of the charm. I think Webster was better than that, though. For one thing, he overtly rejects the ideology that certain speakers have ownership rights to the language that are not shared by other speakers. But on the other hand, he also seems to assume that some speakers are better qualified (and perhaps have a greater right?) 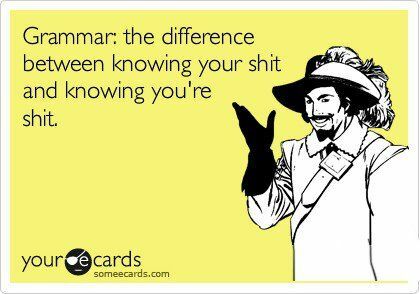 than others to do the work of ascertaining if not determining the prevailing usage norms of American English. In addition to commentary like the example above (i.e. that standardization is “a task reserved for men who shall understand the connection between language and logic, and form an adequate idea of the influence which a uniformity of speech may have on national attachments”), this assumption is also indicated by his frequent use of literary examples that would have been inaccessible to most Americans in 1789 to illustrate linguistic features and especially to exemplify what he considered correct and appropriate usage. These examples are in his own words appeals to “the authority of…good writer[s] in the language” (201) and generally exclude usage norms of rural, nonwhite, and non- or semi-literate speakers. Ironically, most of these examples are taken from British-authored texts. So while I continue to ponder Webster, the process of standardization in American English and American history, and the zeal of self-appointed guardians of the language, I’ll leave it to Whitman to take us home. If they are not just as close as they are distant, they are nothing. This is the common air that bathes the globe. Note: The title of this post, “So Appropriate to Our America and the Genius of Its Inhabitants,” is borrowed from Walt Whitman’s 1856 essay “America’s Mightiest Inheritance,” in which he celebrates the English language. I am getting ready to teach English 3720: Development of Modern English this fall, a course in the history of the English language, for what will be the 12th or 13th time, and I am thinking about the first course I ever took in linguistics as an undergraduate English major. It was a course a lot like the one I’ll be starting again next week, only it had a different number and a different name: LIN 4100: History of the English Language. The course was taught by Dr. Marie Nelson, one of only two female professors I had as an undergraduate, which will give you some idea of how long ago this was but probably the wrong idea, because it wasn’t long enough ago to make sense of the appalling lack of female faculty members at my otherwise much-loved alma mater. Like many English majors, I majored in English because I liked books, reading them and writing about them and talking about them. Also like many English majors, I discovered early on that having to read Othello, Last of the Mohicans, and Vanity Fair in the same week and write papers on two of them could kind of take the fun out of pretty much everything I thought I’d like about majoring in English. So after a few semesters of frantically reading everything as fast as I could in time to write the papers and get on to the next ones, I noticed in the course offerings for the coming semester this thing called History of the English Language and thought, well, that sounds interesting and also like there won’t be a 400-page book to read for it every week. I signed up, and it turned out I was right on both counts. Of course, it also turned out that this was the hardest English class I had taken to date, and it was to retain that crown through the rest of my undergraduate career. It was also the gateway drug that led me to linguistics. A few years ago, I got to wondering about how the history of the language came to its place in the curricula of undergraduate English programs, which is to say it is often the only linguistics course offered to English majors, if there is even one offered at all. What lucky accidents of history had there been that led to the lucky accident of my happening upon and signing up for LIN 4100? Had I not taken that single course 25 years ago, I don’t know what direction my life might have taken. Had I not received credit toward my major, I probably would not have taken the class. Today I am doing the only thing I have ever really wanted to do, which is teaching and doing research in linguistics. It’s because of that class that I am doing it. Language is on my mind all the time, every day. I started writing down interesting things I noticed about the way people talk when I was seven. I didn’t know that was linguistics. I didn’t know there was such a thing. So much in life depends on the ways that we categorize and classify things, how we name them and organize them and attach value to them. I work at a university, so the accidents of curricula and boundaries of academic discipline are categories of particular interest to me. About five years ago, I started collecting books on the history of the English language. Today I have about 40 in hard copy and another 15 or so in electronic format. Some of these are completely awesome, although not all for the same reasons. It turns out that the genre is a fairly recent development, at least when you consider it in relation to how long the English language has been around. The first books to resemble in content and structure the ones I use in my courses today appeared in the mid-19th century. I take this to mean that the establishment of the history of the English language as an object of academic inquiry dates to the mid-19th century as well. Some of the first people who held the kind of job that I have now, the job of professor of English, once that became a thing that people could be, thought it was important for their students to learn something about the history of the language, as an end in itself or for the purposes of literary studies, i.e. so that they could read literary texts written in Old or Middle English. This belief seems to have followed from the European scholarly tradition of philology, which encompassed the study of literature and comparative linguistics (the historical study of languages to determine ancestry and relatedness). English departments today are direct descendants of the philological tradition that evolved into “English” as an academic discipline, and the respective statuses of literature and linguistics were actively negotiated from the earliest establishment of the new discipline. Over time, literature assumed primacy in most departments. Taking another perspective, Desire for Origins: New Language, Old English, and Teaching the Tradition (1990), Allen Frantzen’s analysis of the history of Anglo-Saxon studies, challenges the marginalization of Anglo-Saxon studies in the twentieth century and its subordination to the kind of literary study that does not require dealing with any difficult old languages. And it turns out that Frantzen beat me to the punch by about 20 years with his observation in this 1990 book that most of the major works on the history of English studies — he cites Ohlmann, Graff, and Scholes and also Eagleton’s Literary Theory (1983) — are actually histories of English literary studies. “None of these works analyzes the place of English linguistic history,” Frantzen observes. “Apart from a few pages in Graff’s Professing Literature, the topic is untouched” (7). So it’s not just me. The growing primacy of literature as the focus of English studies programs seems to have had the effect of recasting philology as something primarily associated with linguistics and as something other than (and subordinate to) literary study, although prior to the establishment of English literature as a legitimate academic pursuit, when it was still considered insufficiently rigorous (Graff 1987, 28), there already was a literary component for many philologists. This literary orientation is encoded in some of the definitions that are out there for philology, historical as well as more recent definitions, although in trying to figure out exactly WTF philology was and is, I have not exactly found consensus. This has led me to believe that either (a.) there is no agreement among scholars on what philology actually is, (b.) the definition has changed over time, or (c.) nobody else really knows WTF it is either. Does philology mean comparative linguistics, or did it mean that at some time in the past? Is it the same thing as historical linguistics? 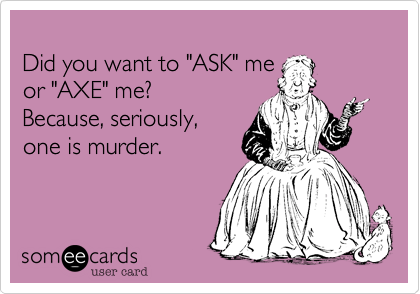 Is it linguistics in the service of literature? In the introduction to Inventing English: A Portable History of the Language (2007), Seth Lerer offers a linguistic definition: “Philology means ‘love of language,’ but for scholars it connotes the discipline of historical linguistic study” (2). The Oxford English Dictionary makes room for literary study: “Love of learning and literature; the branch of knowledge that deals with the historical, linguistic, interpretive, and critical aspects of literature; literary or classical scholarship.” But the OED also offers a sense that is specifically linguistic: “The branch of knowledge that deals with the structure, historical development, and relationships of languages or language families; the historical study of the phonology and morphology of languages; historical linguistics.” The former is labeled obsolete; a note on the latter observes its increasing rarity: “Linguistics is now the more usual term for the study of the structure of language and . . . has generally replaced philology” (italics in original). So, an etymological argument about philology could be made by those who want to claim for the history of the English language — and for English linguistics more generally — a supporting role in the study of literature. If you’re a linguist in an English department (or in any department named for a language or family of languages), certainly this is better than no role. But as Frantzen argues (rightly, in my view), this perspective can be cause for concern: “Professionals in the academy are not today necessarily less conscious of language than they were in previous eras. But they have, by and large, stopped valuing linguistic history. . . . [and] what the many do not value, their students will not learn about” (Frantzen 1990, 2-3). By the late 19th century and into the 20th, the challenge was coming from those whom Graff (1987) describes as “the generalists” (81-97), literature-oriented scholars who charged philology, with its emphasis on linguistics, with being too difficult, uninteresting, and as having “no end but itself,” as one late nineteenth century literary scholar put it (qtd. in Frantzen 1990, 76). Attention to language for its own sake risked the consequence of “divert[ing] attention from thought,” according to one influential professor of political science at Princeton, Woodrow Wilson (qtd. in Frantzen, 76). The trend toward literary study as the central focus of departments of English in the United States continued through the first quarter of the twentieth century and beyond, bolstered in the 1930s by the rise of the New Criticism, which emphasized study of the literary text apart from any external context. And later in the twentieth century, the rise of literary theory, which Robert Scholes (1998) argues in The Rise and Fall of English ought to “[constitute] the disciplinary core” of English studies today (147), continued the trend of treating literary pursuits as central to English studies. 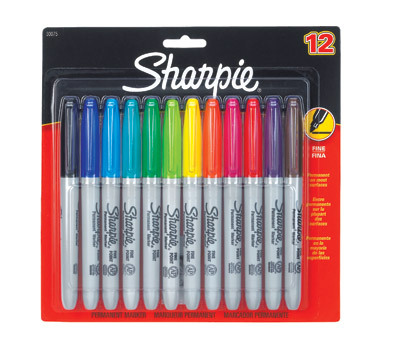 In his proposal to reconstruct English studies “as a discipline of textuality” (146), Scholes emphasizes history, production, and consumption, along with theory, as the bases for organizing the discipline (146-184). There doesn’t seem to be a whole lot of space for linguistic study in this model, and Scholes’s emphasis on “history” as he outlines it in Rise and Fall does not include the history of the language. He does mention it in passing, though, in reference to disciplinary origins: “As a field of study in the United States, English has been organized around the literary history of England and America. . . . And somewhere near the center, but almost obscured now, lies a philological organization of the field in terms of the history of the English language” (145). The term philology is rarely used in twenty-first century English departments, although a few years ago a visiting candidate for the chairship of my department said to me (jokingly I presume), “Oh, you’re a philologist!” When I attempted to correct him, he interrupted laughingly to say, “Linguists hate being called philologists!” I did not get the joke, maybe because of the multiple meanings embedded in the term or maybe because of my consciousness of the way those long-ago struggles for disciplinary self-definition and conflicting meanings still reflect the day-to-day realities in my experience as a linguist in an English department. Or maybe it just wasn’t funny. Further complicating all this is that English departments today, including mine, are still trying to define English studies, to our own satisfaction and to that of our students, in the context of shifting academic and intellectual trends and priorities within and around the discipline. Our work on this project is further complicated by fiscal and political pressures that don’t always (or really ever) prioritize intellectual value, quality, and rigor as highly as we do, which is of course all the more reason for us to insist on these priorities. I guess I don’t really have any answers here, just a lot of questions and hope that a collegial spirit within which a diversity of “English studies” can thrive and a wider intellectual culture in which knowledge is automatically assumed to have intrinsic value will prevail. Bacon, Alan, ed. (1998). The Nineteenth-Century History of English Studies. Brookfield, VT: Ashgate. Court, Franklin E. (1992). Institutionalizing English Literature: The Culture and Politics of Literary Study, 1750-1900. Stanford: Stanford UP. Eagleton, Terry (1983). Literary Theory: An Introduction. Minneapolis: U of Minnesota Press. Frantzen, Allen J. (1990). Desire for Origins: New Language, Old English, and Teaching the Tradition. New Brunswick, NJ: Rutgers UP. Graff, Gerald (1987). Professing Literature: An Institutional History. Chicago: U of Chicago Press. Lerer, Seth (2007). Inventing English: A Portable History of the Language. New York: Columbia UP. McMurtry, Jo (1985). English Language, English Literature: The Creation of an Academic Discipline. Hamden, CT: Archon Press. Ohmann, Richard (1976). 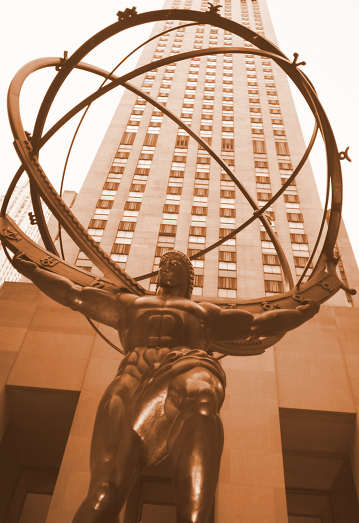 English in America: A Radical View of the Profession. New York: Oxford UP. Palmer, D. J. (1965). The Rise of English Studies: An Account of the Study of English Language and Literature from Its Origins to the Making of the Oxford English School. London: Oxford UP. Scholes, Robert (1998). The Rise and Fall of English: Reconstructing English as a Discipline. New Haven: Yale UP. All images in this post are original photos for which I hold the copyright. Please do not use without permission. In the midst of a recent dialect-literature reading binge, focusing primarily on American frontier literature of the “Old Southwestern” variety, I ended up spending more time than I intended on The Narrative of the Life of David Crockett, of the State of Tennessee, Written by Himself (1834). It is available for free online, and although I am linking to it, I do not want it to be interpreted that I necessarily recommend this book. As its title announces, it was (ostensibly) authored by the celebrated frontiersman-turned-congressman David “Davy” Crockett (1786-1836) but in actuality it was probably written by Thomas Chilton, Crockett’s friend, roommate, and fellow member of Congress. Artistically, it doesn’t have much to recommend it, although if you enjoy tall tales with frontier settings, and you don’t mind some politics mixed up with your entertainment, you might like it. 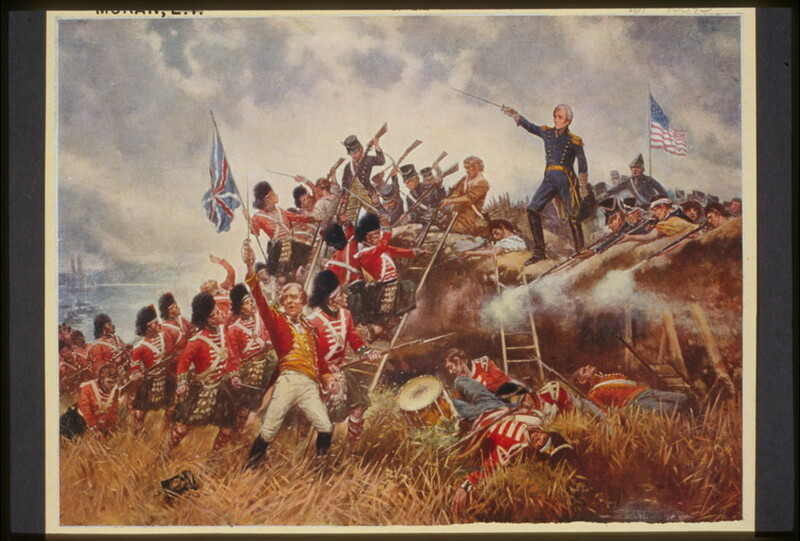 Crockett fought under the command of then-General Andrew Jackson in the Creek War (1813-14) and ran for Congress in 1824 (he lost) and again in 1826 (successfully) as a Jacksonian Democrat. To oversimplify this ridiculously, Jacksonian Democrats professed to favor working people over the wealthy, the separation of church and state, and the popular vote. Later, however, he broke with Jackson, a split usually attributed primarily to Crockett’s opposition to Jackson’s draconian policies toward Native Americans, and joined the Whig party. The Whigs hoped that Crockett’s humble beginnings and romantic frontiersman image would make him a serious challenger to the powerful and iconic Jackson, who was seen by his supporters as a champion of the “common man” against the powerful and moneyed elite. 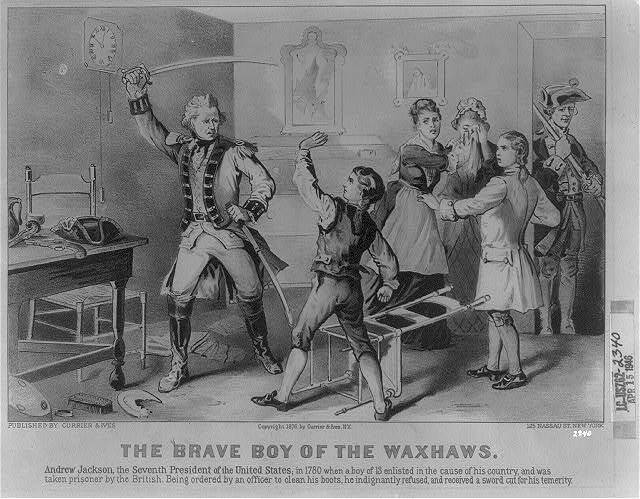 Jackson had received minimal education, fought in the Revolutionary War at age 13, and was orphaned at 14, and his subsequent rise to power and legendary bad-assery made him an extraordinarily popular if also a controversial and highly polarizing figure. The Narrative of the Life of David Crockett is a campaign autobiography and a pretty early representative of the genre. Published in 1834, it precedes by a year Augustus Baldwin Longstreet‘s Georgia Scenes (1835), an early and highly influential contribution to the 19th-century American literary subgenre known as Old Southwestern humor. Georgia Scenes is widely acknowledged as a prototypical text in that tradition as well as in the trend toward realistic fiction that emerged later in the century. The Narrative of the Life of David Crockett is not necessarily the first thing I would think of when I’m on the topic of Old Southwestern humor (which I am quite often), but it turns out to be a fair (and early) example of the genre, except that it’s pretty short on the humor part. But then, being short on humor is apparently no disqualification. Just as the setting for Old Southwestern humor is not what anyone would consider “Southwestern” these days, I have my doubts as to whether anyone would actually consider it humor. Most of it ranges from the “uh, OK” level of humor to the pretty horribly offensive kind: racism, violence, cruelty to animals, etc. But it is at least sort of old, enjoying a decent run of popularity from the early 1830s to the 1860s. 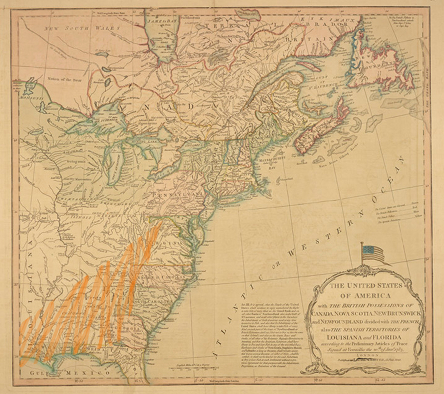 The addition of these new states, part of a long-term project of westward expansion that began with the Louisiana Purchase in 1803, redefined what constituted “the West” in the United States, hence the “old” modifier in “Old Southwestern,” meaning that Old Southwestern humor was already a nostalgia genre as early as the 1830s. Featuring frontier settings, exaggerated folk-heroic characters, and vernacular speech, Old Southwestern humor is a minor genre in the overall scheme of American literature, although it was popular in its day, and as I mentioned earlier, was influential on some rather more significant literary trends and genres, as well as on the work of several major American authors. The Narrative of the Life of David Crockett shares with the Old Southwestern tradition its frontier backdrop, attempts at representing dialectal speech visually, a larger-than-life backwoodsman protagonist, and as Mark Twain might have put it, some “stretchers.” For example, in a lengthy exposition on how he spent his time off during a congressional term for which he was not re-elected, Crockett describes having killed 105 bears in a single winter. However, the Narrative‘s deployment of vernacular speech does not incorporate many of the techniques that became conventional in the genre, largely popularized if not actually pioneered by Longstreet in Georgia Scenes, although it does incorporate some nonstandard linguistic features, most of them grammatical (for example, regularized past-tense knowed appears 57 times in the Narrative compared to 16 occurrences of knew). Later writers tended to rely on more overtly visual cues to signal a vernacular speaker’s otherness, linguistic and otherwise, especially by respelling words to represent nonstandard pronunciations. In The Conjure Woman (1899), for example, Charles W. Chesnutt writes befo’ to indicate a character’s pronunciation of before with postvocalic /r/ deletion. Some authors in the 19th century, including Chesnutt, used literary dialect — that is, visual/textual representations that attempt to capture the qualities of real speech, especially stigmatized varieties and features — as a device to portray language realistically, although that reality was usually articulated from a white, middle class vantage point (as evidenced by the rarity of white, middle- and upper-class characters represented as speaking anything but the standard). But as the example of Chesnutt — who was African American — indicates, the deployment of literary dialect was not limited to white authors, especially toward the end of the 19th century and into the 20th, although a white reading audience was generally considered a requirement for commercial success. Because of the association of vernacular speech with low-status speakers, the application of literary dialect, and especially the kind of other-marking associated with nonphonetic respellings, does not generally function to enhance the stature of characters whose speech is rendered dialectally. So it might seem strange for the Narrative to traffic in this particular device when enhancing Crockett’s stature is precisely the goal, although the nonphonetic respellings are relatively infrequent and perhaps innocent. By “innocent,” I mean if Crockett actually penned parts of the Narrative himself, claims to which effect have been made despite his extremely limited schooling and, consequently, what had to be limited facility in writing, these examples might be his own original spellings. They include choaked for choked, did’ent for didn’t, harricane for hurricane, and mockasin for moccasin. The OED contains no evidence of the harricane spelling as a common variant at any time, although it documents numerous variant spellings for moccasin, including mockasin, until around 1800, from which point the present-day standard moccasin variant seems to have prevailed. My guess is that the mockasin spelling in the Narrative is either a pronunciation spelling of Crockett’s or a deliberate reminder (in the service of his challenge to the Jacksonian archetype) of his limited education, designed to show how far he has come. Harricane may similarly be a pronunciation spelling, but if it is, it functions somewhat differently from the mockasin spelling in that it indicates a stigmatized pronunciation, lowering to [ɑr] in the first syllable where [ər] is standard, at least as of later Early Modern English, anyway, and especially in American English. Renderings of [ɑr]-lowering are a common — if stereotyped feature — in written representations of Appalachian English, and therefore it is not surprising to find it in a representation of Crockett’s speech given his East Tennessee provenance, and it may have been a pronunciation he actually used. In other words, if these spellings are original to Crockett himself and not artistically licensed inventions, either they slipped by Chilton uncorrected, or they were deliberately left in as a way to try to bolster a public image of Crockett as an icon of the “common man” archetype, in this case by highlighting his own minimal education. If the author had been content to have written his opinions about me, however contemptuous they might have been, I should have had less reason to complain. But when he professes to give my narrative (as he often does) in my own language, and then puts into my mouth such language as would disgrace even an outlandish African, he must himself be sensible of the injustice he has done me, and the trick he has played off on the publick. I have met with hundreds, if not with thousands of people, who have formed their opinions of my appearance, habits, language, and every thing else from that deceptive work. Now, I haven’t yet conducted a comparative analysis of the ways that Crockett’s speech is represented in the two texts, but I am looking forward to that project and to seeing whether there are any substantial differences between the ways his speech is represented in Sketches and Eccentricities versus the Narrative. But at this point — and I should qualify this by saying that so far I have done only an abbreviated, impressionistic eyeballing of the texts — I am not feeling particularly sympathetic, since he seems to have no reservations whatsoever about presenting himself (or authorizing Chilton to do so) as using stigmatized features — especially grammatical features — when it suits his purposes, which is seems to do in the Narrative. 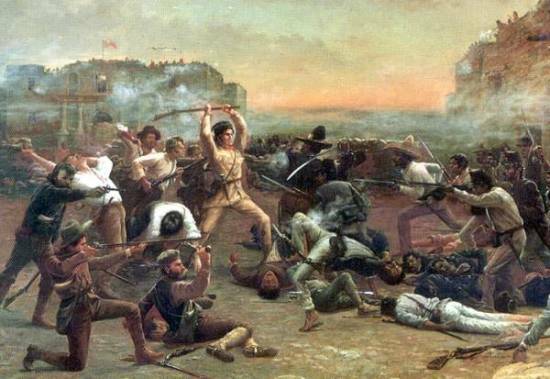 Davy Crockett was such an unbelievable tool that he almost makes you feel a little sympathy for Andrew Jackson. I have since had time to take a more nuanced approach. However, I stand by my initial claim that Rep. Crockett was in fact a tool, but I will now acknowledge that he was also more complicated than that, that even a tool can have a soul. Crockett’s surfaces in the evolution of his position on the treatment of Native Americans. I don’t think that lets him off the hook for atrocities he almost certainly committed during the Creek War, but after spending the last nearly two months now trying to figure out what to do with this guy, I am releasing this post into the wild and wishing the myth of David “Davy” Crockett all the best. You know the drill by now: The usual disclaimer applies. I am a professor of English linguistics, so I am like totally credible and everything, but this blog has not been vetted or peer reviewed and therefore is not to be considered a scholarly source for anyone out there who might be looking for information for a research paper. Also, these are my original words, and while some of what is posted herein is based on widely known and available information, that doesn’t mean you can take my words or my ideas and use them as your own. That’s plagiarism and it isn’t right, so don’t do it.